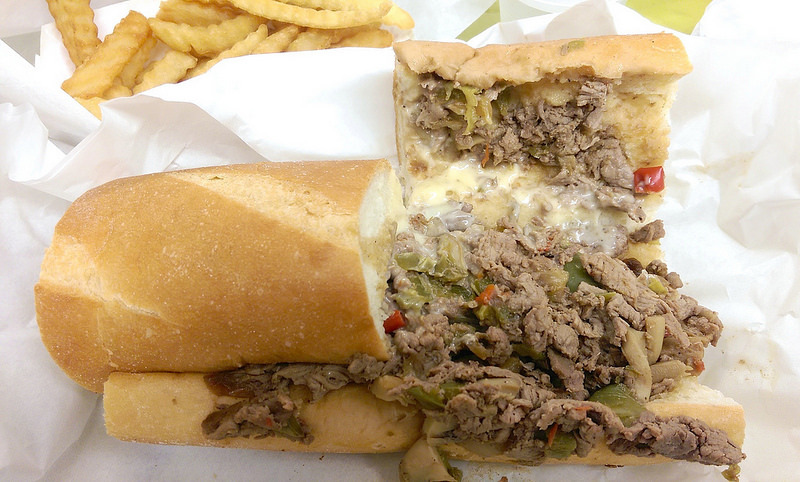 I grabbed a cheesesteak from Amato’s with a few coworkers! We went to the original location on Saratoga Ave; they now have a second location on Almaden Rd. I got “The Works”, which includes mushrooms, bell peppers, onions, cheese, and steak. They also had two jars of self-serve peppers; one jar has sliced spicy peppers while the other is uncut and on the sweeter side. A cheesesteak, also known as a Philadelphia cheesesteak, Philly cheesesteak, cheesesteak sandwich, cheese steak, or steak and cheese, is a sandwich made from thinly-sliced pieces of steak and melted cheese in a long roll. A popular regional fast food, it has its roots in the city of Philadelphia, Pennsylvania. The cheesesteak was developed in the early 20th century “by combining frizzled beef, onions, and cheese in a small loaf of bread,” according to a 1987 exhibition catalog published by the Library Company of Philadelphia and the Historical Society of Pennsylvania. The meat traditionally used is thinly sliced rib-eye or top round, although other cuts of beef are also used. On a lightly oiled griddle at medium temperature, the steak slices are quickly browned and then scrambled into smaller pieces with a flat spatula. Slices of cheese are then placed over the meat, letting it melt, and then the roll is placed on top of the cheese. The mixture is then scooped up with a spatula, pressed into the roll, and cut in half. Common additions include sautéed onions, peppers, mushrooms, mayonnaise, hot sauce, salt, pepper and ketchup.